I woke up the morning of January 8th, 2011, and lay in bed, waiting for Theo to kick me good morning. I was 34 weeks pregnant, and this was our wake-up ritual: he would wriggle around like a maniac, and I would spend a few minutes lying on my side, rubbing the outline of his body and telling him what we were going to do that day. Sometimes he would stick his feet in my ribs, and I would tickle his toes. Sometimes he would take a big stretch and I would try to map out how he was sitting inside of me. That morning, though, I didn’t feel anything. No big deal, I figured; he was probably asleep. Surely it wouldn’t be long before he was awake and kicking up a storm. I had a bagel and coffee for breakfast and then lay on the couch with Matt, waiting for the caffeine to pass through the placenta and jolt Theo awake. We were watching a movie, but I couldn’t concentrate on it; all I could think about was the absence of movement inside of me. I tried everything I could think of to get Theo to move – I drank ice water and lay on my side, poked and prodded him until I worried that I might be bruising my baby in utero, had Matt put his mouth up against my belly and talk to his son. Nothing worked. We decided that we should go to the hospital. When we got to the labour and delivery ward, I had to sit and wait for a bed to become available. Then we discovered that I hadn’t properly registered, so Matt had to go back down and re-do the paperwork. I was becoming increasingly anxious, and I was frustrated that the nurses didn’t seem to share my sense of urgency. Finally, they got me into an examining room and asked me where my OB usually found the baby’s heartbeat. I said it was loudest on the left side of my belly, so they put the doppler there. I started to cry. Matt tried to say something to calm me down, but he had tears in his eyes, too. The nurse frowned and moved the doppler around while the continuing silence made me sob harder and harder. This must have only gone on for a few seconds, but it seemed like hours. I was sure that Theo was dead; I pictured having to call my mom to tell her that her grandchild wouldn’t be born alive. I pictured myself having to be induced and delivering a cold, white baby. Finally, way over on my right side, the nurse found a faint but steady heartbeat. The nurse smiled and said that she’d known all along that he was fine. I still couldn’t stop crying. The nurse brought in a portable ultrasound machine, since I still wasn’t feeling Theo move. As she moved the probe over my belly, she asked me if I knew that he was breech. No, he’s not, I said, he’s been head down since 26 weeks. In fact, I had seen my OB three days earlier, and he had confirmed that the baby was head down. Not anymore he’s not, said the nurse. They brought in the on-call doctor who confirmed that no only was Theo breech, he was footling breech, one of the rarest fetal positions and the most dangerous to the baby. On top of that, his umbilical cord was hanging down by his feet, which meant that, if my water were to break, he would be at high risk for a cord prolapse. They hooked me up to a contraction monitor and told me that I was having strong contractions (none of which I could feel, by the way). They checked my cervix and I was 2 cm dilated and 100% effaced. Not a big deal, they said – some women dilate early. Two hours later I was 5 cm dilated. At 34 weeks pregnant, I was in labour with a baby who wanted to meet the world feet first. They wanted to do a caesarean that night. They would have, too, except that two emergency c-sections came in, tying up all the operating rooms. While we waited for an OR to open up, I sat in my bed and tried to use Jedi mind-tricks to stop my labour. Think calm thoughts, I told myself. I stared at the printout on the contraction monitor and willed the jagged lines to smooth themselves out. I stared at my belly and willed Theo to stay put. Whatever I did must have worked, because by the time they checked my cervix again, I was still 5 cm dilated. My contractions continued, but were definitely less frequent than before. I made a deal with the on-call OB – if they would agree to delay my c-section, I would stay on bed rest in the hospital until I was full-term and/or my cervix started dilating again. She wasn’t thrilled with the idea, but she agreed to admit me for the night and check with my doctor. Luckily, he was a super cool dude, and when he came to see me on Monday morning he said he thought I’d made a good suggestion, and was totally fine with me hanging around the hospital until whenever. This gave me some time to figure out what I was going to do. Up until this point, I’d planned on having a natural birth; I’d read books like Ina May Gaskin’s Guide to Childbirth , Martha Sears’ Birth Book and Henci Goer’s The Thinking Woman’s Guide To A Better Birth. I’d looked forward to giving birth, imagining that I would have some kind of mystical earth goddess experience; I’d been weirdly excited to know what real contractions felt like. I’d spent months participating in online pregnancy forums, decrying the medicalization of childbirth and the deplorable c-section rate in the western world. I hadn’t even read anything about c-sections, because there was no way that I was going to have one. I started to look for online resources for moms who were having caesareans but still wanted the whole touchy-feely earth goddess experience. I discovered, to my chagrin, that there weren’t many. Most people seem to think that a good birth and c-sections are diametrically opposed. Many people in the natural birth community are very, very anti-caesarean (one woman even went so far as to send me a video of a midwife delivering a footling breech birth, like, hey, thanks for your support), and many of those who support the medical model of childbirth tend to see birth as something that you just endure and get through, rather than a positive experience. I think that it’s totally possible to have a c-section and still have a good birth. 1. Educate yourself. This one is huge. Read as much as you can about c-sections, both about the procedure itself and what recovery will be like. Talk to other women who have had c-sections, and ask your OB for a run-down of how the procedure typically happens at your hospital. It’s also a good idea to read about the possible emotional effects of a c-section. 2. If you plan on breastfeeding, consider contacting a lactation consultant (the nice thing about being in the hospital was that the lactation consultant came to me), or else join the La Leche League and talk to women who have had similar experiences. Find out what kind of resources your hospital offers breastfeeding mothers – for example, mine held a breastfeeding class twice a day and had a lactation clinic. Make sure you get yourself a nursing pillow, because I promise you that you will be SO THANKFUL for it. Also,there are some good resources online here and here and here. 3. If you plan on breastfeeding, do so as soon as possible after surgery. I was able to breastfeed in the recovery room, less than half an hour after my son’s birth. 4. Make a birth plan of what you would ideally like to happen. You can ask for things like playing your own music during the surgery, doing skin-to-skin in the OR, and delaying (or even forgoing) the application of the eye gel. Remember that it doesn’t have to be the mother who does skin-to-skin – your partner also has some important bonding to do. 5. Eat really well at your last meal before your surgery (this will typically be 8 hours earlier). Make sure you get a lot of protein and that whatever you have is really filling, because they won’t let you eat afterwards until you fart (not kidding). 6. If you are having a c-section because your baby is breech, consider trying an external cephalic version. I wasn’t able to do this because I continued having contractions right up until my c-section (and we discovered during my surgery that I have a heart-shaped uterus, so it wouldn’t have worked anyway), but it’s definitely worth trying. 1. Educate yourself about c-sections anyway! It won’t hurt, and you’ll be prepared in case you do need one. 2. 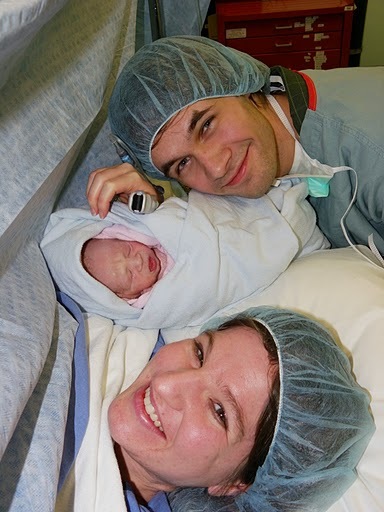 Include a “Caesarean Contingency Plan” as part of your birth plan. Sure, chances are that you won’t have a c-section, but if something goes wrong, it’ll probably go wrong pretty quickly, which means that it would be better to have what you want written out ahead of time. 3. Make sure that your partner is clear on what you want if you need a c-section – in the craziness of the OR, you’re going to need them as an advocate more than ever. 1. Allow yourself the time to mourn the birth you didn’t have. Some women feel that they’ve “failed” if they end up having a c-section; some feel that they haven’t really given birth. Talk about your feelings with your partner, and remind yourself that your experience was just as important and valid as anyone who had a vaginal birth. 2. Keep in mind that women who have c-sections are at a higher risk for postpartum depression. Make sure to watch yourself carefully for any of the signs and talk to a healthcare professional immediately if you think you might be showing some of the symptoms. 3. Take all of your medication on time. Trust me, you will feel way worse if you delay or skip a dose. The vast majority of medications are safe for breastfeeding; if you’re not sure, ask your doctor, nurse, pharmacist or La Leche League leader. 4. Hold a pillow against your incision whenever you cough, sneeze or laugh. I don’t know why, but this helps. 5. Take a shower as soon as you are feeling up to it. It will be the best shower of your whole life. 6. Accept help. If you have someone willing to do everything for you, let them. Theo’s birth wasn’t what I had planned for, and it wasn’t the birth I would have chosen, but it was still good. I sometimes think that this was my first real lesson in parenting: the idea that not everything would happen on my own terms, that there would be times when I was not in control of the situation, but could still try to make the best of things. So no, Theo’s birth wasn’t ideal, but I do think that it was the best birth that it could have been. And I’m thankful for that. If you follow the simple steps that I have outlined above, then you, too, can look this happy while having a giant gash cut in their abdomen. If you have any other suggestions, please feel free to add them in the comments!